How Much Does it Cost To Fly To Sacramento? The cheapest flights to Sacramento found within the past 7 days were $155. Prices and availability subject to change. Additional terms may apply. Seattle - Tacoma Intl. - Sacramento Intl. Minneapolis - St. Paul Intl. - Sacramento Intl. O'Hare Intl. - Sacramento Intl. Want to visit sunny California without the hassle, traffic, and inflated prices of LA, San Francisco, or San Diego? Check out our flights to Sacramento, the fourth largest metro area in the Golden State and the capitol of the California! Fly into Sacramento International Airport (SMF) and find yourself moments away from a Cali trip that includes tours of the capitol, an outstanding zoo, and myriad parks and museums, not to mention a plethora of shops, restaurants, and entertainment venues in the Old Sacramento Historic District. As the locals like to say, "California begins here!" Life in this city is more laid-back than in California's more touristy destinations, and the tickets to Sacramento tend to be cheaper, too. All in all, it's a good idea to look into airfare to Sacramento if you want to experience how the locals live rather than bump elbows with fellow tourists everywhere you go. Once you land at Sacramento International Airport, you can head to ground level and wait for the handy rental car shuttle that runs every 10 minutes to take you to the rental car terminal, where you'll have the option of several rental companies to choose from. Don't feel like driving? No problem. Most hotels near Sacramento International run free shuttles, and cabs are plentiful. Cabs are located adjacent to baggage claim, and one-way fare from the airport to downtown is pretty affordable, especially if you're with a group. Sacramento flights are plentiful, as you'd expect for such a politically powerful destination. Cheap flights to Sacramento rarely provide complimentary food, but guess what? Sacramento is America's farm-to-fork capital. Airline food? No thanks! Ready to explore Sacramento? Travelocity can help you find cheap tickets to Sacramento, or if you want, you can save up to $537 when you book Sacramento vacation packages (hotel plus airfare) with us. You can use those few extra bucks to splurge on the city's outstanding cuisine instead! Question : Where can I find cheap flights to Sacramento? Answer : We know you’re looking for the best flights at the lowest fares, so we found some of the sweetest deals in town just for you. 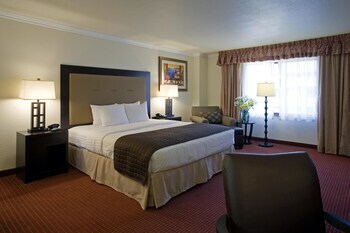 Check out the top flight deals to Sacramento. Act quickly and score yourself a bargain! Alaska Airlines has a flight from to Sacramento departing on 4/16/19 and returning on 4/20/19 all for only $99.00 per person. * Book these Alaska Airlines flights! Delta has a flight from to Sacramento departing on 5/14/19 and returning on 5/18/19 all for only $122.00 per person. * Book these Delta flights! Delta has a flight from to Sacramento departing on 4/24/19 and returning on 4/26/19 all for only $133.00 per person. * Book these Delta flights! Question : What are the most popular airlines that fly to Sacramento? Southwest Airlines Flies 523 flights per week between and Sacramento. American Airlines Flies 258 flights per week between and Sacramento. United Airlines Flies 253 flights per week between and Sacramento. Question : Which hotels are located near airports or major attractions in Sacramento? Answer : We've put together a list of hotels in Sacramento close to airports and popular sights to see. Check out the hotels below. 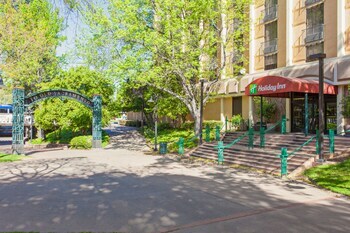 All of them are within proximity to must-see attractions and major airports in and around the city of Sacramento. 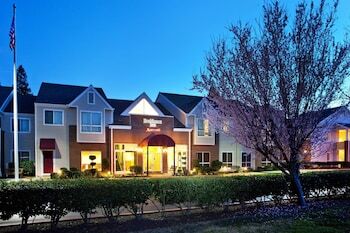 Extended Stay America Sacramento - White Rock Road: Located in the heart of Rancho Cordova, this aparthotel is 0.4 mi (0.6 km) from Sacramento Children's Museum and within 3 mi (5 km) of Mather Sports Center and Mather Golf Course. Race Place Motorsports and Nimbus Dam are also within 6 mi (10 km). This hotel has a 2.00 star rating. 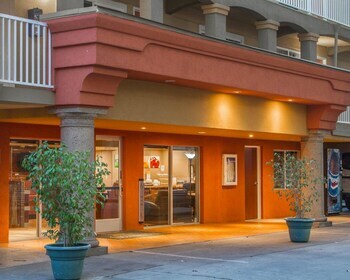 Residence Inn by Marriott Sacramento Rancho Cordova: Situated in Rancho Cordova, this hotel is 0.2 mi (0.3 km) from Sacramento Children's Museum and 2.4 mi (3.9 km) from Mather Sports Center. Mather Golf Course and Race Place Motorsports are also within 6 mi (10 km). This hotel has a 3.00 star rating. 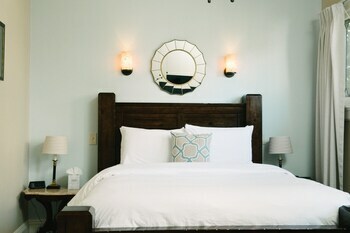 The Citizen Hotel, a Joie de Vivre Boutique Hotel: Located in Downtown Sacramento, this hotel is within a 10-minute walk of Cesar Chavez Park and California State Capitol. Historic Governor's Mansion and California State Railroad Museum are also within 15 minutes. This hotel has a 4.00 star rating. 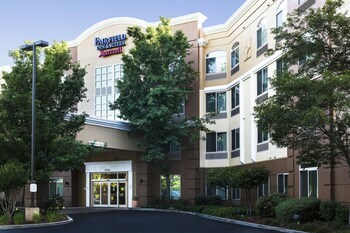 Fairfield Inn & Suites by Marriott Rancho Cordova: Situated in Rancho Cordova, this hotel is 0.2 mi (0.4 km) from Sacramento Children's Museum and within 3 mi (5 km) of Mather Sports Center and Mather Golf Course. Race Place Motorsports and Nimbus Dam are also within 6 mi (10 km). This hotel has a 2.50 star rating. Question : What are the top attractions in Sacramento? Answer : Sacramento has over 93 points of interest for you to choose from. We suggest checking out Sacramento Convention Center and Sleep Train Arena first because they are the most popular attractions in Sacramento. Don't forget about other highly recommended spots like Tower Bridge, Gibson Ranch County Park, and Thunder Valley Casino. Get out there and see what the city has to offer on your trip to Sacramento! terrific hotel and very friendly professional staff.